I wrote this blog post participating in the SocialMoms and eBay blogging program for March of Dimes. I have received compensation for this post. All opinions are 100% my own and may differ from yours. I will only endorse companies, products and services that I believe, based on my own experiences, are worthy of endorsement. I like to consider myself as a fashion forward woman. I keep several classic key pieces in my closet, but add a few trendy pieces each season. At least I think I’m a fashionista wannabe. I also enjoy shopping. A LOT. I tend to do most of my shopping online. One of my favorite places to shop online is eBay. I was thrilled to hear that eBay was working with March of Dimes to help us celebrate the full potential in us all. Check out my #ImBornTo be a Fashionista collection. Include at least 6 products in your collection. Go to www.ebay.com/curateforacause, sign on to eBay with your eBay User ID and password and click “Get Started”. Once you have successfully registered for the Sweepstakes, you will receive one (1) entry in the Sweepstakes each time you create a Collection during the Promotion Period. A Collection consists of six (6) or more eBay products and the title must start with with the hashtag #ImBornTo. Each Collection you create must be unique in order for the Collection to be eligible an as entry. Online sweepstakes entries must be received by 11:59:59 PM PT on March 31, 2014 in order to be eligible. March of Dimes is one of my favorite charities and I think this is a great way to help. Not to mention it would be pretty nice to win a $5,000 eBay shopping spree. I also am an avid reader and curated an #ImBornTo Read collection. 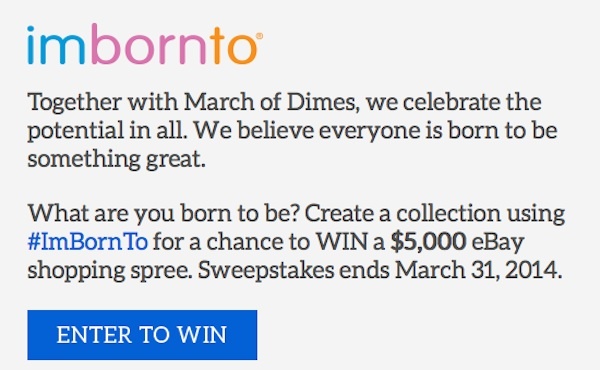 Will you join me in curating your own collection in the #ImBornTo campaign for help March of Dimes? What is your #ImBornTo collection? This is such a great cause! EBay collections are so useful too and with a chance to win $5,000 who wouldn’t want to create one. What a fantastic campaign! I love what March of Dimes does. Here is my collection! I just went and created a campaign. I totally like this idea so much. Thank you for sharing details about this. March of Dimes is a great charity and it’s good to see big companies working to better the lives for those that need it. Love that dress! Off to check out the rest of your collection now! Love to see that Ebay is supporting such a worthy cause.